Theresa Rebeck ’80 says she has a playwright’s brain. The critics and her peers apparently agree: Not only is she an a Pulitzer Prize for Drama nominee and National Theatre Conference Award winner, but Rebeck was also invited to participate in the prestigious Eugene O’Neill National Playwrights Conference in summer 2012 to develop her new play, Fool. She was one of just eight playwrights selected out of nearly 1,000 applicants, an honor she shared with another participant from Notre Dame, Anne García-Romero, who is an assistant professor in the Department of Film, Television, and Theatre. The Notre Dame alumna’s award-winning career has always been multifaceted, however, and she has penned Broadway shows as well as television, films, essays, and, most recently, novels. Rebeck first began writing plays during her undergraduate years in the College of Arts and Letters, she recalls. An English major, she worked closely with the late Joseph Duffy, an English professor; Doug Kinsey, a professor emeritus of art; and playwright Julie Jensen, then a professor in Notre Dame’s theatre program. After graduation Rebeck earned an M.F.A. in playwriting and a Ph.D. in Victorian melodrama at Brandeis University. She then signed with a theater agent who helped launch 22 of her one-act plays and 20 of her full-length plays, including Mauritius (2007), her Broadway debut and Dead Accounts (2012) starring Katie Holmes. But the television industry was interested in Rebeck, too. She created the show Smash, which debuted in February 2012. She has also written for a CBS sitcom, Brooklyn Bridge, and worked on L.A. Law, Law & Order: Criminal Intent, and NYPD Blue. 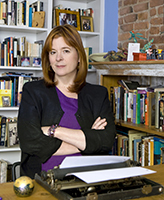 Her work on NYPD Blue garnered the Mystery Writers of America’s Edgar Award, the Writers Guild of America Award for Episodic Drama, the Hispanic Images Imagen Award, and the Peabody Award. Rebeck has also delved into film, producing features such as Harriet the Spy and Gossip as well as the independent films Sunday on the Rocks and Seducing Charlie Barker, an adaptation of her play, The Scene. “You become curious about the other ways you can define reality with language,” Rebeck says of her forays into television, films, and books. The swing between mediums doesn’t always work, she admits, citing Charles Dickens’ notoriously terrible plays. But writing a novel, a genre in which the author must create everything with words instead of props and sets and actors, was a challenge she couldn’t pass up. “Writing a novel was a dream of mine,” Rebeck says, “so I thought I better try this before I die—or I’ll be mad on my deathbed that I didn’t. It then took years to figure out how to start a novel. “I’ve now finished my third novel,” she says. But even with the success of her first two books, Three Girls and Their Brother and Twelve Rooms with a View, she still finds the process challenging. Rebeck has never been one to shy away from a challenge, and it shows. In addition to being an award-winning writer, she was named one of Newsweek’s “150 Fearless Women in the World” in 2011. She also recommends that aspiring writers focus intensely on their craft and attempt to break free from contemporary distractions. Rebeck doesn’t read newspapers. She deleted her Facebook account. She doesn’t watch much television or movies. That free time has allowed her to read incessantly: She’s reading Dostoyevsky’s Crime and Punishment for a third time, Anna Karenina a second, and has read most Dickens’ novels three or more times. Her current fascinations, she says, are historical novels and books about Wall Street. Originally published by Tara Hunt ’12 at al.nd.edu on August 15, 2013.